And some of them have been signed by a "prominent Toronto personality." We'll give you one guess as to who that might have been. 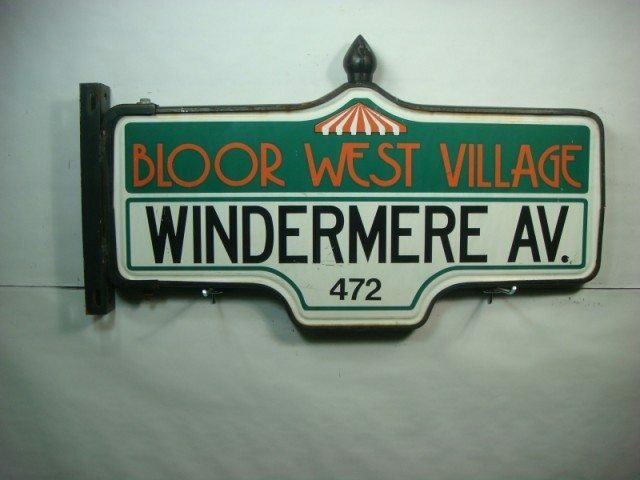 The City of Toronto’s decommissioned street sign auction is now up and running. As of right now, you can visit the Platinum Liquidations Inc. website and browse through photos of street signs that have been retired after providing wayfinding service to our city. There are blue signs and white ones (and even a green one for good measure); ones with little acorns on top and ones without; ones that have as of yet seen no bids at all (many of those are the flat blue modern ones); and ones already drawing interest in the >$200 range. And then, because there is likely some kind of “Rob Ford’s City of Toronto Act” statute that demands it, there are a bunch of signs autographed by our very own mayor. Currently, the Queen Street East and Queen Street West signs not graced with a mayoral autograph are drawing higher bids.